06 « March « 2012 « Nothing in Biology Makes Sense! Do choosy cuckoos choose well-matched hosts? 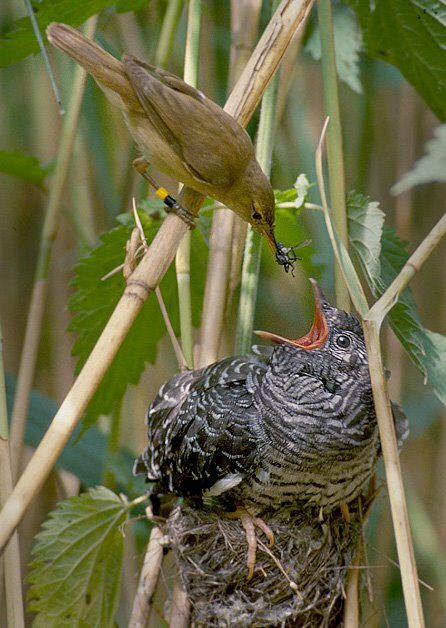 Brood parasitism, the reproductive strategy of choice for cuckoos and cowbirds, sounds like a lazy approach to parenting: lay your eggs in another bird’s nest, and let the unwilling adoptive parents take the trouble to raise your chicks. But contracting out parental care like this comes with many of its own complications. Chicks raised by parents of a different species have to eliminate competition from their adoptive nestmates, and may grow up a bit confused; reluctant host birds may need to be told, and reminded, that raising cuckoo chicks is an offer they can’t refuse. But before crossing all those hurdles, a brood parasite’s first task is to lay eggs in the nest of a host who won’t immediately recognize and reject them. The strong natural selection imposed by host rejection has led cuckoos to evolve “host races” that lay eggs whose color and spotting pattern matched to those of their preferred host species. This kind of broad-scale pattern could arise without much direct effort by female cuckoos—those who lay eggs in the nest of the best matching host species would simply be the ones most likely to have chicks that survive to the next generation. But is it possible that cuckoos do take an active role in matching up to their hosts, seeking out host nests containing eggs that look like their own? The answer, according to a series of studies over the last several years, is yes—probably.